Wagamama at intu Metrocentre has been named the chain’s Restaurant of the Year – beating 114 other branches nationwide to the title. And bosses put their success down to increased interest in Japanese cuisine and a growing awareness of the health benefits of a low fat diet. 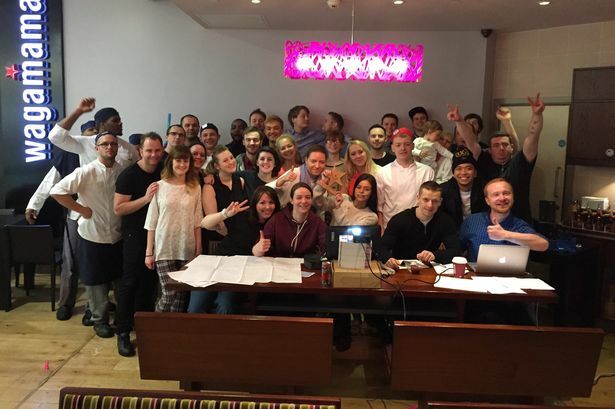 The restaurant, which can be found in the Yellow Mall’s Qube opened three and a half years ago, and won the award after exceeding its sales targets and putting a training programme in place for staff from other Wagamama branches. The restaurant’s general manager, Rhian Davey, collected the award on behalf of her 40 full and part time staff, at the company’s annual conference at Windsor. She says: “It’s been a real team effort and I’m delighted that we’ve been named the best branch in the country. Bernice Nesham, asset manager at intu Metrocentre, added: “It is fantastic news to hear about the success of one of our restaurants in the centre. “Having the best bars and restaurants is an important part of our customers’ experience and we’re delighted to hear about Wagamama being voted Restaurant of the Year.